I recently talked to Donna who works at the Hilo BFC and she told me that she reads my blog late at night when she is not making cards. So Hi, Donna! I hope your card making is going well and you are thinking up some great ideas for your class. Besides talking to Donna, I did SOME shopping at the store, of course. I found a Magic Punch that I didn’t see before, the double petal flower. It makes a super cute flower, which works really well with paper printed on one side and solid colored on the other. I also picked up some Sizzlet die cutters for my machine. I’m sure that they would work in the Big Boss, too. The two tag shapes I bought have lots of possibilities. As usual I found more scrapbook paper than I really need, but they were so pretty. I like the new floral papers from Me and My Big Ideas and S.E.I. Lots of the companies have glittery flower stickers and rub-ons, which coordinate with the papers. It’s so easy to put together cards and album pages when everything matches. Spring colors, flowers, and cute animals what could be more inspiring? I can rarely pass the Bead Shoppe without finding something that makes my beading fingers itch. This shopping trip I noticed some carved stone pendants. They reminded me of the jewelry that the lead actress wears on the TV show, ‘Bones’. The jewelry on that show is fabulous and has an antique, sometimes earthy look. Anyway, I thought pairing the large carved pendant with some carved green chalk beads and agate and then stringing them on dark brown silk thread would give me the ancient look I wanted. See the photo. (Click to enlarge.) I made this necklace extra long (30”) so it would be more dramatic and used an S-hook clasp so that I can add more strands if needed. I’ll try to put this project on this website soon. Well, the next newsletter is off to be printed so I can relax for a while. To amuse myself I made a humorous Easter card. At least I thought it was humorous, but my hunny bunny and baby bunny did not think it was funny, so I guess I’ll be sending the card to my funny bunny, the White Rabbit hiding out in his Honolulu burrow. 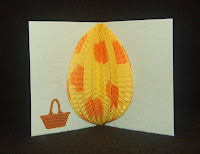 The rabbits on the front of the card were made with a Martha Stewart rabbit punch and the inside honeycomb egg is actually from a package of hanging Easter egg decorations. 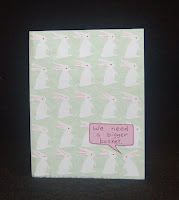 See photo (of the card, not the White Rabbit). I’m not a gardener (probably because I dislike dirt and sun), but I wish I had flowers in my yard. Luckily, I have a neighbor, Laura, who does have a green thumb so I get to enjoy seeing her flowers. Thankfully also there are numerous floral themed craft supplies available at Ben Franklin Crafts. I am very fond of the dimensional flower stickers by Martha Stewart and Jolee’s. In the coming weeks I hope to utilize spring flowers in my website projects. I have lots of ideas for Mother’s Day and graduation crafts but for now I think I’ll sit back and dream a little while reading some issues of craft magazines…. ahhhh…. spring break! Actually, I’ve been playing with my new craft tool toys. The Zutter binding machine has given me endless possibilities for making bound books for myself as well as allowing me to create special albums for gifts. I like that the binding rings come in various colors and sizes. It’s also nice that the machine is small because it leaves me space for more craft supplies. 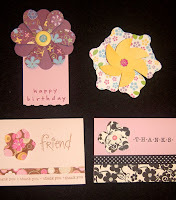 I love the new flower punches by Punch Magic that punch out paper shapes to fold into 3-D flowers. These dimensional flowers can quickly turn a blank card into a handmade creation by just adding a stamped message, glitter glue, and ribbons. I am pleased with myself when I can recycle anything. These punches allow me to turn cards sent to me into cards to send to others. Sometimes I use the wrapping paper or birthday card that someone gives me and I make a recycled thank you card for that person. That person can then cut off the front of the card and attach it to a blank card and we can both feel good about saving paper. Save a tree, recycle!